Image caption Antarctica's freezing conditions helped to preserve this cake, which researchers say is in "excellent condition"
Ice-covered Antarctica is one of Earth's most hostile natural environments. 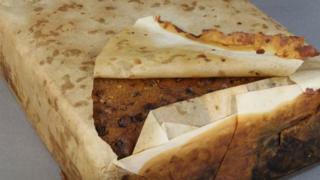 But a new find by the Antarctic Heritage Trust suggests it's no match for a 106-year-old British fruitcake. Conservators found the elderly cake on Cape Adare, and believe it belonged to British explorer Robert Falcon Scott - known as Scott of the Antarctic. Although the tin was rusted, the team said the cake was in "excellent condition" and smelled edible. The New Zealand-based trust found it in Antarctica's oldest building, a hut built by Norwegian explorer Carsten Borchgrevink's team in 1899, and used by Capt Scott in 1911 during his Terra Nova expedition. "Fruitcake was a popular item in English society at the time, and it remains popular today," Lizzie Meek, conservation manager for artefacts at the trust, told National Geographic. "Living and working in Antarctica tends to lead to a craving for high-fat, high-sugar food, and fruitcake fits the bill nicely, not to mention going very well with a cup of tea." Conservators have been excavating artefacts in the hut since May 2016, and have unearthed some 1,500 items. They include tools and clothing, and - according to Ms Meeks - some "badly deteriorated" meat and fish, and "rather nice-looking" jams. Everything they find - fruitcake included - is restored and returned to its original resting place. The cake's survival is bittersweet, as Capt Scott and his companions were not so lucky. They successfully reached the South Pole, only to find a Norwegian team had beaten them to it by 33 days. Scott and four of his team died on their way back to base.